rather we are borrowing it from our children. We take the stewardship of our 48 acres and the planet very seriously. We respect each branch we use, every tiny piece of wood that is crafted into a wooden ring. In honour of trees, we'd like to share a selection of poems, quotations and proverbs about trees and their place in our hearts and in our lives. Just think of the trees: they let the birds perch and fly, with no intention to call them when they come and no longing for their return when they fly away. If people's hearts can be like the trees, they will not be off the Way. The pine tree seems to listen, the fir tree to wait: and both without impatience: - they give no thought to the little people beneath them devoured by their impatience and their curiosity. 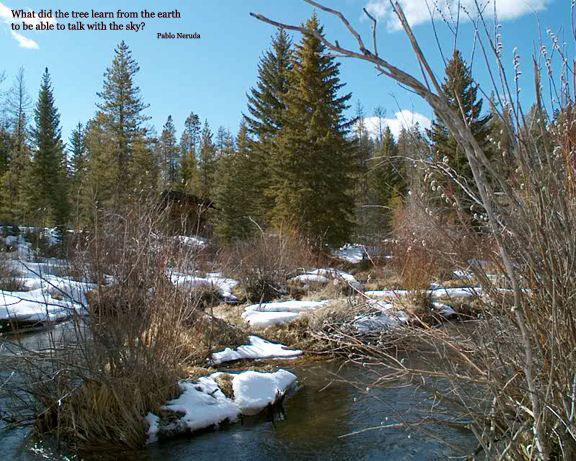 At the headwaters, our creek in early spring. Touch Wood Rings. Since 1999.